“Whiplash” is a colloquial term used to describe a type of neck injury that occurs due to a sudden extension of the neck. According to the Mayo Clinic, rear-end car accidents are a primary cause of whiplash. The most common symptoms of whiplash are neck and back pain, sensory disturbance, and headaches. These symptoms often take several years to stabilize. 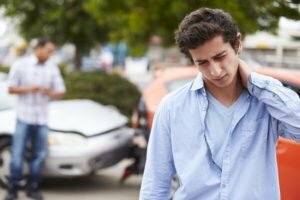 If you were sidelined from work or hit with a steep medical bill due to whiplash you sustained in a car accident, contact the Troutman Law Office. You may have grounds for a claim against the driver who caused your injuries. Matt Troutman has been a practicing attorney since 1986. He will evaluate your case in a free initial consultation. Call to speak with a personal-injury lawyer in Lexington. While some people recover from whiplash within a few weeks, others notice pain and stiffness for several years. It typically takes about two years for the symptoms of whiplash to stabilize, according to the National Center for Biotechnology Information. Chronic neck or back pain is a telltale sign of whiplash. 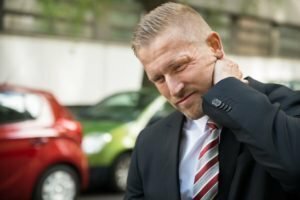 According to a study published in Neurology, at least 8 percent of people who sustained whiplash were unable to return to their usual levels of activity for 12 months after their injuries due to stiffness and pain. How Can I Shorten the Recovery Time? Visit a doctor immediately if you were involved in a rear-end accident or if you notice the symptoms of whiplash. A fast diagnosis and treatment may shorten your recovery time. Apply ice to your neck to reduce swelling and pain. Ice your neck every three to four hours for at least the first two days after your injury. Your doctor may recommend painkillers. Naproxen (Aleve) and ibuprofen (Motrin, Advil) are typically effective for treating whiplash. Ask your doctor before taking any over-the-counter painkiller. Wearing a collar or neck brace can prevent further injury, but they are not intended for long-term use. A report by the Washington Post revealed that there are more than 1.7 million rear-end accidents in the United States annually. These collisions cause approximately 500,000 injuries and 1,700 deaths. The vast majority – 87 percent – of rear-end accidents happen because a driver is not paying attention. If you were injured due to a negligent motorist in Kentucky, you may be able to claim compensation for medical bills, lost income and other damages from the at-fault driver. A personal-injury lawyer from the Troutman Law Office will evaluate the merit of your case in a free initial consultation. Call to speak with an accident attorney in Lexington.